PFG are renowned for creating durable products for harsh environments and we take pride in the quality of our workmanship. We develop world-class and rugged workboats, so durable that the first boat we built in 1994 has not yet reached end of life and remains in full commercial survey. PFG brings technology to it’s customers and we have remained at the leading edge of technological-based solutions to improve operational efficiency. We have a number of world-firsts and operate within a mature product development framework that demonstrates a culture of creativity and innovation. This is reflected in our Aquatruck range. PFG knows that it’s Aquatruck vessels exceed each customers expectations with respect to stability, rideability and handling. We are excited to provide Defence, Border Control, Public Safety, Fisheries and Parks around Australia with a reliable solution that significantly reduces operating costs, improves operational availability and provides lower risks to operators through improved fatigue, vibration and exertion characteristics. Aquatruck offers zero corrosion, resists fouling, is easily maintained and has a 50 year UV protection. Aquatruck last four times longer than its alloy competitors by its robust, durable HDPE construction, good design and structural integrity. Aquatruck materials and construction energy has a carbon footprint five times lower than alloy or GRP. Customer’s choice in design, performance and features is our mission. Each vessel we produce starts with a full consultation with our customers and the PFG team to fully understand the requirements and application of the vessel. A range of some of the vessels we have produced are featured below with their individual specifications. Please contact us to discuss your requirements. Small tender unique in that its one piece moulded. 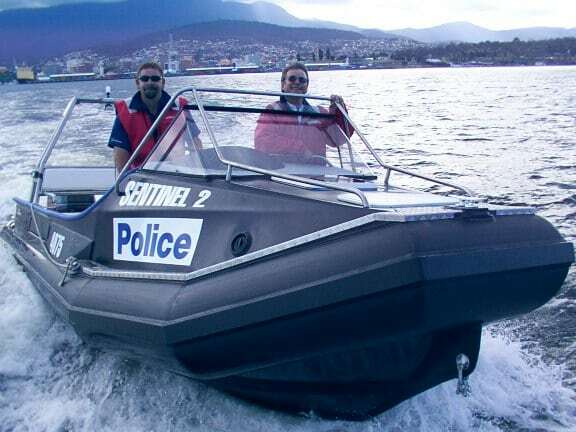 This Vessel Tender was designed by AllCraft Naval Architecture, Tasmania, it is 2.8 Metres in lenght and has a 1.55m bean. It has an 80kg air filled or 120kg foam filled displacement, it has an 11kW or 19kW outboard motor. 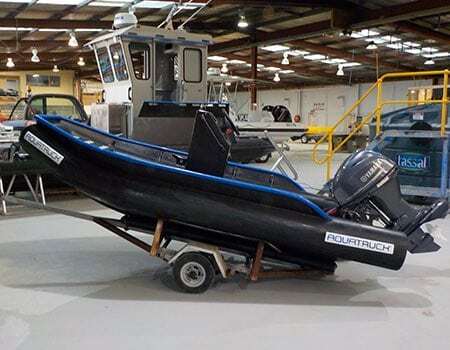 Hard collar small fast tender (son of Ocean 8.8), support boats in the tuna and salmon industries in Tasmania, South Australia and internationally. Utility/commercial, military, rescue, private. 6.80 metres lenght, 5.55 metres waterline length with a 2.5 m beam and 0.45 m draught. 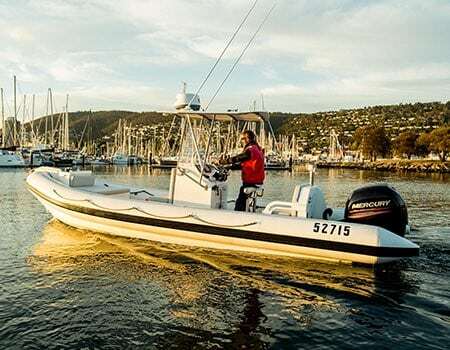 It has 2,200kg; 2,600kg full load displacement and main engines: 2 x 112kW Mercury 4-stroke outboard engines, The maximum speed is 41 knots, cruising speed is 30 knots and the fuel capacity is 220 litres. Can hold up to 7 passengers. Vehicle barge and oil spill response vessel for Port Hedland WA with other possible applications in defence and search and rescue. Perfect for commercial and recreational diving. Equipped with a removable dive door and a built in ice box. An elevated platform barge used for maintenance work on boats and wharfs. An all round work boat used as an oyster processing platform on Bruny Island. A stable, fast platform with great load carrying capabilities, suited to most commercial and industrial applications. Built for D’entrecastreau Oyster Farm, Tasmania, it is 10.0 m length, 9.0m waterline length with a 3.0 m beam and 0.3 m draught. The main engines are 2 x F150hp 4 stroke Yamaha outboard motors, each 112kW. 2,500kg light 6,000kg heavy displacement. Maximum speed 35 knots, cruising speed 18 knots. The cranes maxlift 180, fuel capacity 200 litres. Our range of durable vessels are manufactured to the National Standard for Commercial Vessels from high density polyethylene (HDPE), a material that is incredibly strong very buoyant, presents a quality smooth finish and resists biofouling. 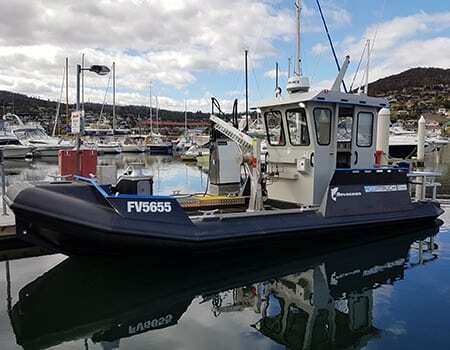 Our workboats draw on PFG’s forty year experience of welding HDPE for commercial marine equipment and is part of the PFG quality system, including weld stress tests through the University of Tasmania, and NATA certification of our fabricators. Twenty plus years’ experience building the world’s toughest workboats allows us to deliver the best solution to our customers globally. 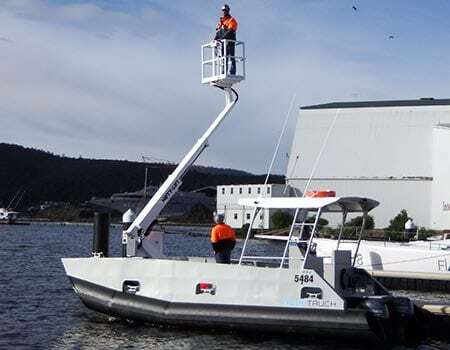 We have evolved our HDPE vessels into a tried and proven platform for many applications by utilising Tasmania’s rugged coastline and fierce weather conditions as our testing ground. We have supplied vessels throughout Australia and into Canada and Norway. 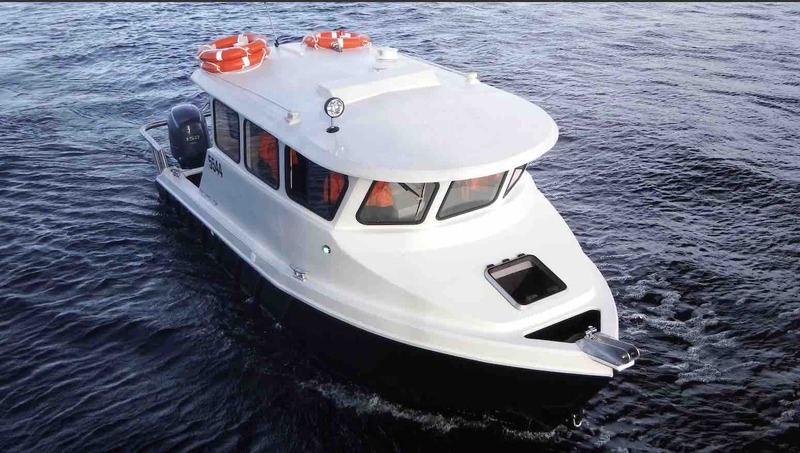 We offer our clients a carbon footprint twenty percent less than competitors materials, a life span several times longer than competitors and almost zero maintenance on the hull. In addition, our workboats provide a smoother ride, reducing long-term fatigue and operator safety risks. 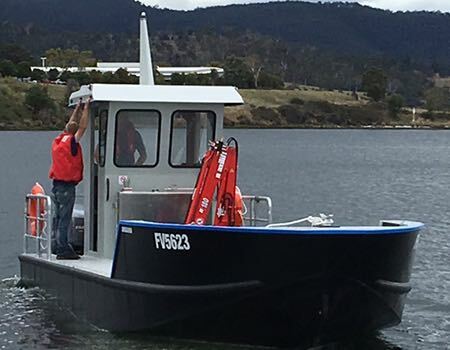 Aquatruck Defence has taken more than 20 years of PFG’s experience developing HDPE commercial boats for the marine industry in Tasmania where every aspect of design and function are put to the test year after year by extreme weather, arduous tasks and tough operators. 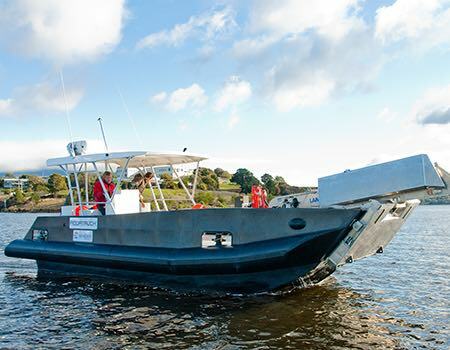 This unique environment has become the R & D testing ground that provides the ultimate testimony to the durability our traditional HDPE work boats and has become the obvious platform for us to move boats into national security and military environments. 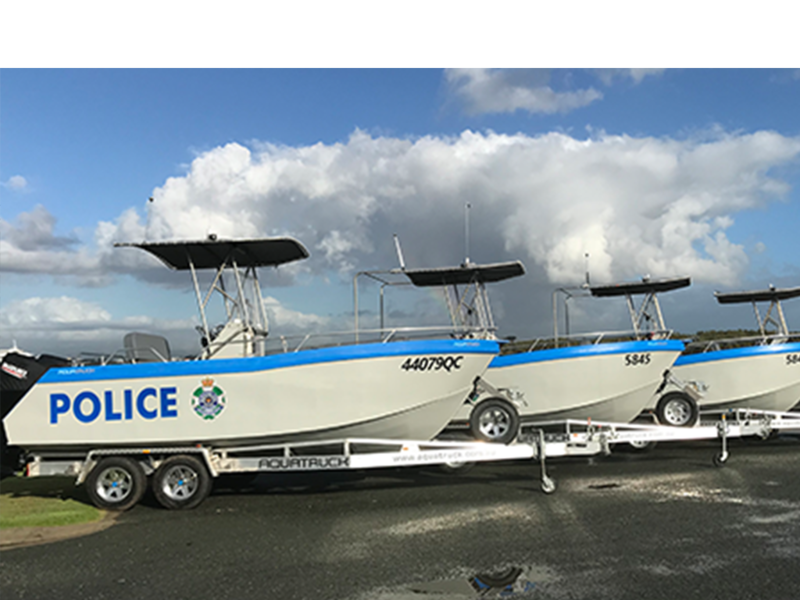 Aquatruck Defence has already proven itself with Tasmania Police operating five Aquatruck vessels since 2002, and Queensland Department of Public Safety placing a multi vessel build order for coastal patrol in northern waters. Clearly what-ever your operational environment, Aquatruck can meet your specifications. 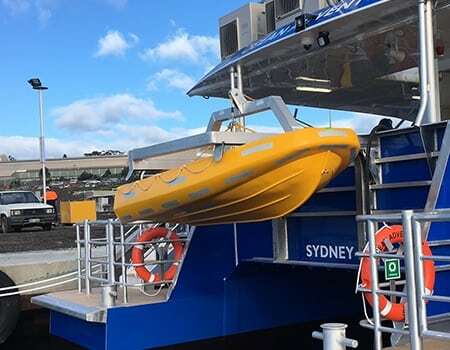 Defence Science and Technology have documented the effect of traditional alloy rigid hull inflatable boats – RHIB’s – causing fatigue and health damage to crew members in high speed water transits. 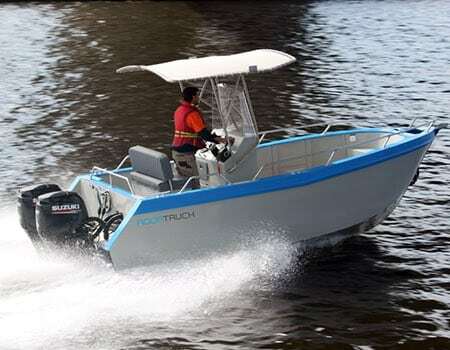 Aquatruck vessels deliver an inherently smooth ride at full speed due to the low centre of gravity, high density “thick” shock absorbing materials, proven design and build methods. 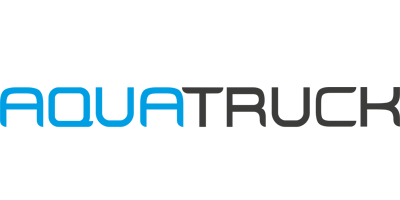 It is these virtues that Aquatruck can bring to a new generation of evolved design fast military vessels, as well as a wide range of practical workboats for maintenance and support. For defence and enforcement applications we offer a military off the shelf specification based on our proven high speed range of vessels.